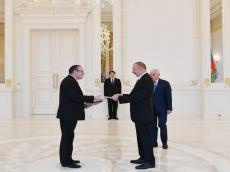 President of the Republic of Azerbaijan Ilham Aliyev received credentials of newly appointed Ambassador Extraordinary and Plenipotentiary of Russia to Azerbaijan Mikhail Nikolayevich Bocharnikov June 10. Bocharnikov reviewed the guard of honor. He presented his credentials to President Ilham Aliyev. Then Ilham Aliyev spoke with the ambassador. The Azerbaijani president noted successful development of Azerbaijani-Russian ties in the political, economic, energy, military-technical, humanitarian and other fields. President Ilham Aliyev stressed that he regards relations between the two countries as strategic partnership. Noting that these relations have a rich history, President Ilham Aliyev expressed confidence in the further successful and dynamic development of these ties. Bocharnikov noted that Russian President Vladimir Putin instructed him to make every effort to strengthen ties with Azerbaijan during his diplomatic activity. Bocharnikov noted that Russian-Azerbaijani relations are successfully developing in all areas. Noting that Russia is watching with interest the development processes taking place in Azerbaijan in all areas, Bocharnikov stressed that the landscaping work he saw during several days of his stay in Baku made deep impression on him. During the conversation, the sides exchanged views on the prospects of the Azerbaijani-Russian relations. In addition, the head of state received credentials of newly appointed Ambassador Extraordinary and Plenipotentiary of Peru to Azerbaijan Maria Milagros Castanon Seoane. Ambassador Maria Milagros Castanon Seoane reviewed a guard of honor. Maria Milagros Castanon Seoane presented her credentials to President Ilham Aliyev. Ambassador Maria Milagros Castanon Seoane extended greetings of Peru`s President Martin Vizcarra to the head of state. The ambassador noted that she will spare no efforts to develop relations between the two countries during her tenure. Maria Milagros Castanon Seoane stressed the importance of defining possible areas of cooperation between Azerbaijan and Peru, adding there is good potential in the field of agriculture. President Ilham Aliyev underlined the necessity of defining directions for the development of the bilateral ties. The head of state said that it is possible to expand cooperation in a number of fields, including agriculture, adding this sphere is one of the priority areas in Azerbaijan`s development. President Ilham Aliyev thanked for the greetings of President Martin Vizcarra and asked Maria Milagros Castanon Seoane to extend his greetings to the president of Peru. On the same day, President Ilham Aliyev received credentials of newly appointed Ambassador Extraordinary and Plenipotentiary of Bulgaria to Azerbaijan Nikolay Hristov Yankov. Ambassador Nikolay Yankov reviewed a guard of honor. Nikolay Yankov presented his credentials to President Ilham Aliyev. The head of state said that bilateral relations between Azerbaijan and Bulgaria are developing successfully, and stressed the importance of high-level reciprocal visits. President Ilham Aliyev recalled the trips of Bulgarian presidents and prime ministers to Baku and his visits to Bulgaria. President Ilham Aliyev expressed hope that Nikolay Yankov`s activity will contribute to the expansion of the bilateral cooperation. Ambassador Nikolay Yankov extended greetings of Bulgarian President Rumen Radev to President Ilham Aliyev. He congratulated the head of state on his re-election as president as well as on the occasion of the 100th anniversary of the Azerbaijan Democratic Republic. The ambassador praised friendly relations between the leadership of the two countries and emphasized its role in developing the bilateral ties. Touching upon the Southern Gas Corridor project, Nikolay Yankov said that the implementation of this project is of great importance in terms of ensuring European energy security as well as diversifying Bulgaria's gas supply, adding his country could play a transit role in this project in the future. He once again reiterated Bulgaria`s political commitment to the realization of this important project. President Ilham Aliyev noted the significance of the recent inauguration of the Southern Gas Corridor in Baku and stressed that TANAP will be put into operation in the coming days. The President said that the Southern Gas Corridor project has been successfully implemented. The head of state noted that Bulgaria is an important part of this project and could play a transit role in the future to deliver Azerbaijani gas to other countries. President Ilham Aliyev thanked for the greetings of President Rumen Radev and asked Nikolay Yankov to extend his greetings to the president of Bulgaria. They exchanged views over various aspects of bilateral relations between Azerbaijan and Bulgaria, in particular prospects in economic, tourism, investment making and agricultural fields.